Not quite sure how all of these Moriarty folks connect, but there's little doubt that they are all connected. From the Kansas 1865 Census (August 31, 1865), Clear Creek Township, Nemaha County, Kansas. etc. *Note: I read somewhere in a book that John Mitchell (born Ireland 1846-died 1890) and Mary (Moriarty) Mitchell of Clear Creek had a kid named Daniel S. Mitchell born June 23, 1875. 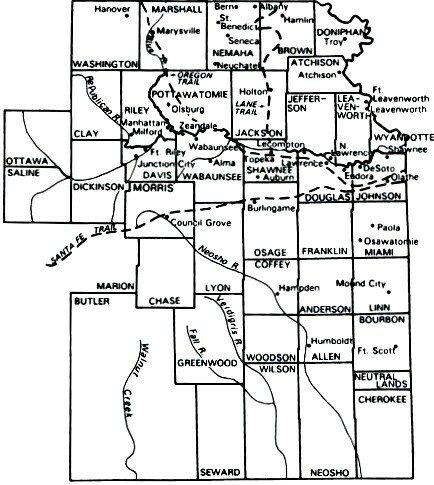 Also note: there are at least two Moriarty homesteaders in Clear Creek Township, Nemaha County, Kansas in 1859: J. and P. Moriarty. Hoping to trace the Moriarty family/families back to Ireland. In a lot of cases, one spouse has died and these are second spouses. And there was no birth control to speak of.